On Friday, March 19, 2010, the Talujon Percussion Quartet comes to the University at Buffalo’s Lippes Concert Hall performing a concert of contemporary percussion music. Thoroughly committed to the expansion of the contemporary percussion repertoire as well as the education and diversification of its worldwide audience, their residency at the Center for 21st Century Music and the Department of Music also includes master-classes on Friday, March 19, 2010 at 1pm and a composer workshop with the UB graduate composers on Thursday, March 18, 2010 at 4pm. All master classes and workshop sessions are free and open to public and will take place in Lippes Concert Hall. Described by the New York Times as an ensemble possessing an "edgy, unflagging energy", the Talujon Percussion Quartet has been mesmerizing audiences since 1991. 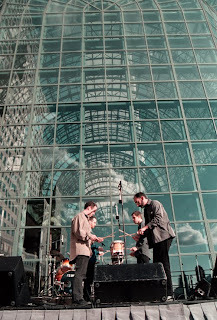 Based in New York City, Talujon performs regularly for highly regarded organizations such as the Lincoln Center Chamber Music Society, Bang on a Can, Carnegie Hall, Symphony Space, Harvard University, and the Percussive Art Society. For tickets to Talujon's concert visit the Lippes Concert Hall website.